Ah, Summer! For those of us with up and coming high school juniors and seniors, this means getting prepared (mentally and emotionally) for a college tour. I am on my last of five children, and while the process is different for every kid, I’d like to offer a little advice that I’ve learned along the way. 1. First of all, have your child schedule his/her own college tour. Yes, you need to talk to them about appropriate times and so forth, but once you’ve decided on day and approximate time, have them either go online (most of the time) or call to schedule a personal tour. They need to know how to do stuff like this, and if they can’t do it now, you’ve got a lot of work ahead of you–but at least now you know it. For most of us, this trip will be a drive, possibly a hotel, while for others there are flights and car rentals involved. No, your student probably isn’t ready to schedule all of that, but they can and should be the ones to contact the college and make arrangements for what will happen pertaining to the campus visit. 2. The time to talk about money is BEFORE the college visit. Students need to have a clear idea of what they have before they go college shopping. Sure, there may be great packages and merit aid. But, your student is an adult now. Treat them as such and have that conversation. At the college tour, your kid should have a concrete understanding of terminology such as “cost of attendance” and “tuition” versus “student services.” Every college does this a little bit differently. If you’re paying for your child’s college, you need to decide how much choice you’re willing to give them. After all, it’s your money. But it’s their life. Get this all worked out (individually and together) before heading out to that first visit. 3. When you arrive, diligently consider NOT going on the tour with them. Yes, you read that correctly. Go on a different tour, or skip the tour altogether. Really. They need to see what they need to see without your input and commentary. You can tell them ahead of time what things to look for. You can talk after the tour about what they liked and disliked but let them have their own first reactions to this place that might be their home for the next few years. 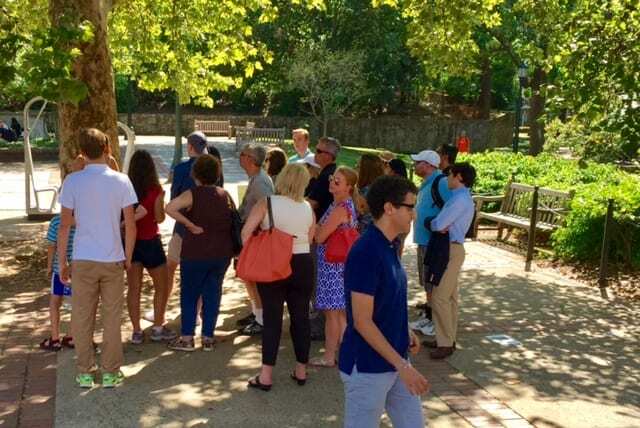 Some colleges are embracing this idea by offering parent tours separate from student tours. You’re different people, in different positions, looking at different things. Oh, and if going on a tour without you causes your kiddo anxiety, that’s an issue you need to know about now. How will they do on their own? 4. If going on the college tour is something you cannot bring yourself to miss, be mindful that this is THEIR decision. Yes, you’re older and wiser, but this is their time to learn, which they can’t do if you’re monopolizing the conversation with the tour guide. So, lean back, if you will. Pass the baton. Follow along and listen. Save your questions for the tour guide until the end. Nothing ruins a college tour faster than a domineering parent (and whether we want to believe it or not, we are all that domineering parent at some point). 5. Try to keep your enthusiasm in check. We parents get a little giddy about stuff like this. I did with my first. I got so excited and she got so excited – and after the first year she said, “Sorry Mom, but I just didn’t like it as much as you did. I tried. I really tried.” Funny thing – I didn’t love her college! I was just trying so hard to make sure she loved it that I failed. She transferred after her freshman year. Remember that what’s good for you doesn’t always equate with what is good for your student. Likewise, what is good for one of your children isn’t necessarily what is best for another one of your children. I went to a massively huge university, as did my second child. My eldest went to a smaller state school and then transferred to an even smaller state school. Some kids do well in the Greek system; others not so much. Athletics, clubs, music, and theater—-all of these things are individual choices that only your student can make. Use your phone so that they’re dated and time stamped with no effort on your part. Designate yourself as the official photographer. You can go around and get pics during the tour that you’re not on. Later, these photos will serve as an invaluable reference. Believe it or not, after two colleges, they all start getting muddled in our brains. Specifically, my kids liked the pictures of the recreation center, the dorms, and the union. Let’s face it, classrooms are boring! 7. During the visit, try to get them to have the most authentically ‘student’ experience as you can. While they attend, they probably won’t be able to afford the $40 gourmet pizza place across from the Physics building, so don’t go there for lunch. Eat at the cafeteria, if possible. See what’s available on Cheapo Street. Later, when your kiddo attends, you can splurge on $40 pizza when you come for parent’s weekend. If you know a student who attends, meet and chat with them. Fellow students who are not tour guides are painfully honest! People watch, and then ask, “Is this what you thought it would be?” or “Do these people seem like people you’d get along with?” Tour guides will highlight all of the cool things available to do, but encourage your student to see where and what other students are actually doing. Most kids will not end up in “Cheer Club” or “Student Government.” Pick up a student newspaper. From this, you can get a “vibe” about what’s happening and what’s important on campus. 8. When it’s over, ask your kiddo what they felt was left out of the campus tour. This will give you a clue about what they’re interested in that is “out of the ordinary” from other prospective freshmen, OR it may give you an idea of the college doesn’t have that your child wants. 9. Work with your child to create baselines. Have them write down the top five things about each college, and the worst three things. I know – getting them to do this is painful. But this will serve as a good reference when it comes to decision time. 10. And finally, humbly recognize that there are many pathways toward a college degree. My middle child, after several college visits, decided that college wasn’t what he wanted at that time. Instead, he joined the military, and has made a career of it. He’s taken college courses when he can, and has refined his passions in the process. I’ve had students who went to college slowly, while working, to avoid student loan debt. Gap years are becoming more popular; let’s face it, few of us knew what we wanted to do when we were 18. Be patient, be loving and have fun. Editor’s Note: Daytripper University is an excellent source for discovering the best places to stay, where to eat, and what to know about colleges you plan to visit. Karin Beckin-Greene drives a Prius, listens to NPR, drinks a lot of coffee, and is a school librarian. But her more important work is keeping up with six dogs, five kids, four cats, three kids-in-law, and a very patient husband.